Text messages on your phone, email on your PC, photos on your tablet, and you constantly shifting your focus between the three to get your work done. Sound familiar? IOgear's KeyShair GKMB02 promises to end all that. Plug this diminutive device into your PC's USB port, establish a wireless connection to your Bluetooth-enabled smartphone and tablet (it supports up to four devices), and you can use a single keyboard and mouse to control and switch between each of them (note: the KeyShair is compatible with the iPhone and iPad, but iOS devices do not support the remote mouse function). You can also cut and paste from a PC or Mac to mobile devices, and create custom shortcuts for iOS and Android functions. Let's say you receive a text message on your phone asking for someone's contact info that's stored only on your computer: You can copy that data from the computer, paste it into a text message on your phone, and then send the message--without ever touching the phone. The software for the host PC is contained on the KeyShair and installs itself the first time you plug in the device. You don't need to install anything on the other devices, you just need to pair them with your PC using Bluetooth. IOgear also announced a new USB 3.0 universal docking station for notebook PCs (Mac and PC) and tablets that have USB ports, such as the Microsoft Surface Pro. 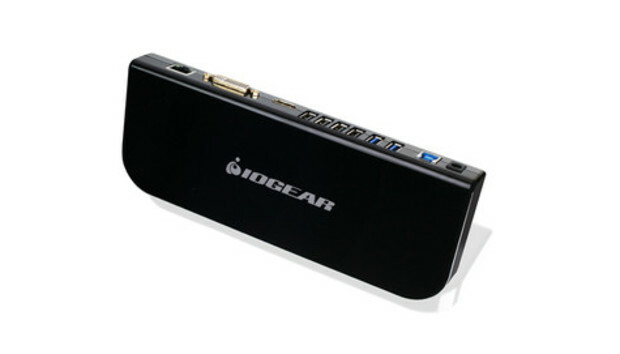 The IOgear GUD300 provides 2 USB 3.0 and 4 USB 2.0 ports, gigabit ethernet, 5.1-channel audio, and two video outputs (DVI and HDMI. HDMI-to-DVI and DVI-to-VGA adapters are included in the box). The dock uses DisplayLink technology to compress the video transmitted from the laptop's USB port and display it on up to two additional monitors. IOgear says the KeyShair GKMB02 will sell for $50 and the GUD300 universal docking station will fetch $150 when both products ship this spring.